In this image taken from video, Gambia's new president Adama Barrow talks during an interview with The Associated Press in Dakar, Senegal, Jan. 21, 2017. New Gambian President Adama Barrow has selected as his vice president a woman who was key in helping united the country's opposition parties against former leader Yahya Jammeh. The choice of Fatoumata Tambajang comes as preparations continue for Barrow to return to Gambia from neighboring Senegal, where he was sworn into office last week as Jammeh refused to leave office. Jammeh left Gambia on Saturday under threat of military action by from the West African bloc ECOWAS.The former president had refused to accept Barrow’s victory in the December 1 presidential election. Barrow told VOA in an interview Sunday that he will establish and truth and reconciliation commission to examine allegations of misrule during Jammeh's 22 years in power. 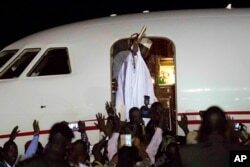 Gambia's defeated leader Yahya Jammeh waves to supporters as he departs from Banjul airport, Jan. 21, 2017. Jammeh left Gambia on Saturday under threat of military action by from the West African bloc ECOWAS. The former president had refused to accept Barrow’s victory in the December 1 presidential election. Journalist Sainey Marenah spoke to Barrow in Dakar, where he was sworn in Friday at the Gambian embassy. The new president said he turned down a request from Jammeh to remain in Gambia, on the grounds that he could not guarantee Jammeh’s security. 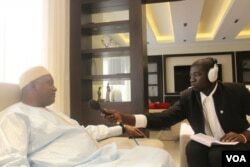 Gambian President Adama Barrow speaks with VOA's Sainey Marenah in Senegal, Jan. 22, 2017. Barrow, 51, said his government will push for comprehensive electoral reforms to ensure future presidents face term limits. Barrow said his administration will work to professionalize the Gambian security forces and the army. “We want to get a very disciplined force that is organized; a force that has training. We want [to] separate the forces. Internal security is police. We want to get the police to do internal security. The military is our defense. There will be serious reform to get that done,” he said. 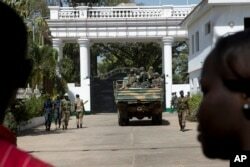 Senegalese troops enter the State House in Banjul, Gambia, Jan. 23, 2017, two days after Gambia's defeated leader Yahya Jammeh left the country. Barrow said he does not intend to retain Jammeh’s Cabinet ministers, but he will reassess the security forces to see where they fit because they are all Gambians. To foreign investors, Barrow said Gambia, often referred to as the “smiling coast,” is back. He refused to say how many terms he would like to serve, saying that decision will be left to Gambians.